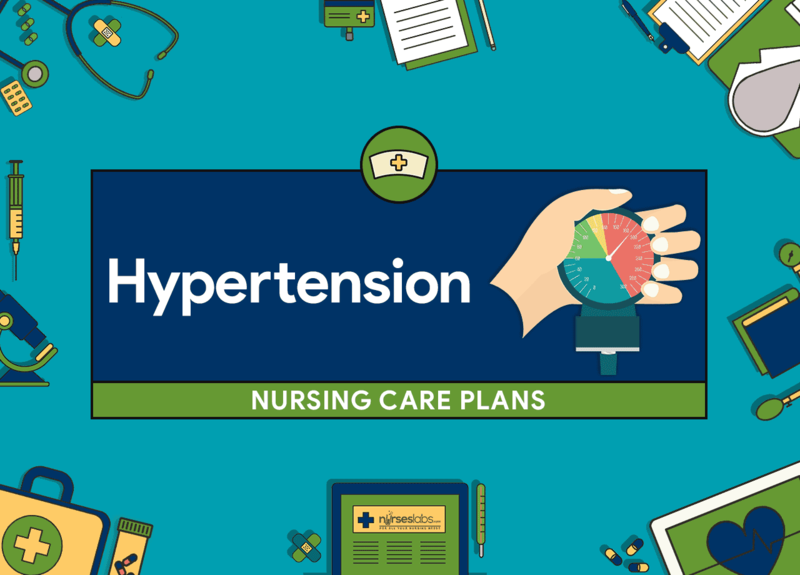 Nursing care planning goals for a client with hypertension includes adherence to the therapeutic regimen, lifestyle modifications, and prevention of complications are the focus of the nursing care for a patient with hypertension. Hypertension is the term used to describe high blood pressure. Hypertension is repeatedly elevated blood pressure exceeding 140 over 90 mmHg. It is categorized as primary or essential (approximately 90% of all cases) or secondary, which occurs as a result of an identifiable, sometimes correctable pathological condition, such as renal disease or primary aldosteronism. Decreased Cardiac Output: Inadequate blood pumped by the heart to meet metabolic demands of the body. Not applicable. Existence of signs and symptoms establishes an actual nursing diagnosis. Participate in activities that reduce BP/cardiac workload. Maintain BP within individually acceptable range. Demonstrate stable cardiac rhythm and rate within patient’s normal range. Participate in activities that will prevent stress (stress management, balanced activities and rest plan). Review clients at risk as noted in Related Factors as well as individuals with conditions that stress the heart. Persons with acute or chronic conditions may compromise circulation and place excessive demands on the heart. Monitor and record BP. Measure in both arms and thighs three times, 3–5 min apart while patient is at rest, then sitting, then standing for initial evaluation. Use correct cuff size and accurate technique. Comparison of pressures provides a more complete picture of vascular involvement or scope of problem. Severe hypertension is classified in the adult as a diastolic pressure elevation to 110 mmHg; progressive diastolic readings above 120 mmHg are considered first accelerated, then malignant (very severe). Systolic hypertension also is an established risk factor for cerebrovascular disease and ischemic heart disease, when diastolic pressure is elevated. Note presence, quality of central and peripheral pulses. Bounding carotid, jugular, radial, and femoral pulses may be observed and palpated. Pulses in the legs and feet may be diminished, reflecting effects of vasoconstriction (increased systemic vascular resistance [SVR]) and venous congestion. Auscultate heart tones and breath sounds. S4 heart sound is common in severely hypertensive patients because of the presence of atrial hypertrophy (increased atrial volume and pressure). Development of S3 indicates ventricular hypertrophy and impaired functioning. Presence of crackles, wheezes may indicate pulmonary congestion secondary to developing or chronic heart failure. Observe skin color, moisture, temperature, and capillary refill time. Presence of pallor; cool, moist skin; and delayed capillary refill time may be due to peripheral vasoconstriction or reflect cardiac decompensation and decreased output. Note dependent and general edema. May indicate heart failure, renal or vascular impairment. Evaluate client reports or evidence of extreme fatigue, intolerance for activity, sudden or progressive weight gain, swelling of extremities, and progressive shortness of breath. To assess for signs of poor ventricular function or impending cardiac failure. Provide calm, restful surroundings, minimize environmental activity and noise. Limit the number of visitors and length of stay. Helps lessen sympathetic stimulation; promotes relaxation. Maintain activity restrictions (bedrest or chair rest); schedule periods of uninterrupted rest; assist patient with self-care activities as needed. Lessens physical stress and tension that affect blood pressure and the course of hypertension. Provide comfort measures (back and neck massage, elevation of head). Decreases discomfort and may reduce sympathetic stimulation. Instruct in relaxation techniques, guided imagery, distractions. Can reduce stressful stimuli, produce calming effect, thereby reducing BP. Monitor response to medications to control blood pressure. Response to drug therapy (usually consisting of several drugs, including diuretics, angiotensin-converting enzyme [ACE] inhibitors, vascular smooth muscle relaxants, beta and calcium channel blockers) is dependent on both the individual as well as the synergistic effects of the drugs.Because of side effects, drug interactions, and patient’s motivation for taking antihypertensive medication, it is important to use the smallest number and lowest dosage of medications. Diuretics are considered first-line medications for uncomplicated stage I or II hypertension and may be used alone or in association with other drugs (such as beta-blockers) to reduce BP in patients with relatively normal renal function. These diuretics potentiate the effects of other antihypertensive agents as well, by limiting fluid retention, and may reduce the incidence of strokes and heart failure. These drugs produce marked diuresis by inhibiting resorption of sodium and chloride and are effective antihypertensives, especially in patients who are resistant to thiazides or have renal impairment. May be given in combination with a thiazide diuretic to minimize potassium loss. Beta-Blockers may be ordered instead of diuretics for patients with ischemic heart disease; obese patients with cardiogenic hypertension; and patients with concurrent supraventricular arrhythmias, angina, or hypertensive cardiomyopathy. Specific actions of these drugs vary, but they generally reduce BP through the combined effect of decreased total peripheral resistance, reduced cardiac output, inhibited sympathetic activity, and suppression of renin release. Note: Patients with diabetes should use Corgard and Visken with caution because they can prolong and mask the hypoglycemic effects of insulin. The elderly may require smaller doses because of the potential for bradycardia and hypotension. African-American patients tend to be less responsive to beta-blockers in general and may require increased dosage or use of another drug (monotherapy with a diuretic). May be necessary to treat severe hypertension when a combination of a diuretic and a sympathetic inhibitor does not sufficiently control BP. Vasodilation of healthy cardiac vasculature and increased coronary blood flow are secondary benefits of vasodilator therapy. Reduce arterial and venous constriction activity at the sympathetic nerve endings. Action is to relax vascular smooth muscle, thereby reducing vascular resistance. These are given intravenously for management of hypertensive emergencies. Angiotensin-converting enzyme (ACE) inhibitors: captopril (Capoten); enalapril (Vasotec); lisinopril (Zestril); fosinopril (Monopril); ramipril (Altace). Angiotensin II blockers: valsartan (Diovan), guanethidine (Ismelin). The use of an additional sympathetic inhibitor may be required for its cumulative effect when other measures have failed to control BP or when congestive heart failure (CHF) or diabetes is present. Implement dietary sodium, fat, and cholesterol restrictions as indicated. These restrictions can help manage fluid retention and, with associated hypertensive response, decrease myocardial workload. Prepare for surgery when indicated. When hypertension is due to pheochromocytoma, removal of the tumor will correct condition. Activity Intolerance: Insufficient physiologic or physiological energy to endure or complete required or desired activity. Use identified techniques to enhance activity tolerance. Report a measurable increase in activity tolerance. Demonstrate a decrease in physiological signs of intolerance. Note presence of factors contributing to fatigue (age, frail, acute or chronic illness, heart failure, hypothyroidism, cancer and cancer therapies). Fatigue affects both the client’s actual and perceived ability to participate in activities. Evaluate client’s actual and perceived limitations or degree of deficit in light of usual status. Provides comparative baseline and provides information about needed education and interventions regarding quality of life. Assess the patient’s response to activity, noting pulse rate more than 20 beats per min faster than resting rate; marked increase in BP during and after activity (systolic pressure increase of 40 mm Hg or diastolic pressure increase of 20 mm Hg); dyspnea or chest pain; excessive fatigue and weakness; diaphoresis; dizziness or syncope. The stated parameters are helpful in assessing physiological responses to the stress of activity and, if present, are indicators of overexertion. Instruct patient in energy-conserving techniques (using chair when showering, sitting to brush teeth or comb hair, carrying out activities at a slower pace). Energy-saving techniques reduce the energy expenditure, thereby assisting in equalization of oxygen supply and demand. Encourage progressive activity and self-care when tolerated. Provide assistance as needed. Gradual activity progression prevents a sudden increase in cardiac workload. Providing assistance only as needed encourages independence in performing activities. Assess emotional and psychological factors affecting the current situation. Stress or depression may be increasing the effects of an illness, or depression might be the result of being forced into inactivity. Acute Pain: Unpleasant sensory and emotional experience arising from actual or potential tissue damage or described in terms of such damage; sudden or slow onset of any intensity from mild to severe with anticipated or predictable end and a duration of <6 months. Verbalize methods that provide relief. Demonstrate use of relaxation skills and diversional activities, as indicated, for individual situation. Note client’s attitude toward pain and use of pain medications, including any history of substance abuse. To assess etiology or precipitating contributory factors. Determine specifics of pain (location, characteristics, intensity (0–10 scale), onset and duration). Note nonverbal cues. Facilitates diagnosis of problem and initiation of appropriate therapy. Helpful in evaluating effectiveness of therapy. Use pain rating scale appropriate for age and condition. Encourage and maintain bed rest during acute phase. Minimizes stimulation and promotes relaxation. Provide or recommend nonpharmacological measures for relief of headache such as cool cloth to forehead; back and neck rubs; quiet, dimly lit room; relaxation techniques (guided imagery, distraction); and diversional activities. Measures that reduce cerebral vascular pressure and that slow or block sympathetic response are effective in relieving headache and associated complications. Eliminate or minimize vasoconstricting activities that may aggravate headache (straining at stool, prolonged coughing, bending over). Activities that increase vasoconstriction accentuate the headache in the presence of increased cerebral vascular pressure. Assist patient with ambulation as needed. Dizziness and blurred vision frequently are associated with vascular headache. Patient may also experience episodes of postural hypotension, causing weakness when ambulating. Provide liquids, soft foods, frequent mouth care if nosebleeds occur or nasal packing has been done to stop bleeding. Promotes general comfort. Nasal packing may interfere with swallowing or require mouth breathing, leading to stagnation of oral secretions and drying of mucous membranes. Analgesics; Antianxiety agents: lorazepam (Ativan), alprazolam (Xanax), diazepam (Valium). Reduce or control pain and decrease stimulation of the sympathetic nervous system.May aid in the reduction of tension and discomfort that is intensified by stress. Identify ineffective coping behaviors and consequences. Verbalize awareness of own coping abilities/strengths. Identify potential stressful situations and steps to avoid/modify them. Demonstrate the use of effective coping skills/methods. Determine individual stressors (family, social, work environment, life changes, or healthcare management). To evaluate degree of impairment. Evaluate ability to understand events, provide realistic appraisal of situation. To evaluate degree of impairment. Assess effectiveness of coping strategies by observing behaviors (ability to verbalize feelings and concerns, willingness to participate in the treatment plan). Adaptive mechanisms are necessary to appropriately alter one’s lifestyle, deal with the chronicity of hypertension, and integrate prescribed therapies into daily living. Note reports of sleep disturbances, increasing fatigue, impaired concentration, irritability, decreased tolerance of headache, inability to cope or problem-solve. Manifestations of maladaptive coping mechanisms may be indicators of repressed anger and have been found to be major determinants of diastolic BP. Assist patient to identify specific stressors and possible strategies for coping with them. Recognition of stressors is the first step in altering one’s response to the stressor. Include patient in planning of care, and encourage maximum participation in treatment plan. Involvement provides patient with an ongoing sense of control, improves coping skills, and can enhance cooperation with therapeutic regimen. Encourage patient to evaluate life priorities and goals. Ask questions such as “Is what you are doing getting you what you want?” Focuses patient’s attention on reality of present situation relative to patient’s view of what is wanted. Strong work ethic, need for “control,” and outward focus may have led to lack of attention to personal needs. Assist patient to identify and begin planning for necessary lifestyle changes. Assist to adjust, rather than abandon, personal/family goals. Necessary changes should be realistically prioritized so patient can avoid being overwhelmed and feeling powerless. Identify correlation between hypertension and obesity. Demonstrate change in eating patterns (e.g., food choices, quantity) to attain desirable body weight with optimal maintenance of health. Initiate/maintain individually appropriate exercise program. Assess risk or presence of conditions associated with obesity Obesity is an added risk with high blood pressure because of the disproportion between fixed aortic capacity and increased cardiac output associated with increased body mass. Assess patient understanding of direct relationship between hypertension and obesity. Reduction in weight may obviate the need for drug therapy or decrease the amount of medication needed for control of BP.Faulty eating habits contribute to atherosclerosis and obesity, which predispose to hypertension and subsequent complications (stroke, kidney disease, heart failure). Discuss necessity for decreased caloric intake and limited intake of fats, salt, and sugar as indicated. Excessive salt intake expands the intravascular fluid volume and may damage kidneys, which can further aggravate hypertension. Determine patient’s desire to lose weight. Motivation for weight reduction is internal. The individual must want to lose weight, or the program most likely will not succeed. Review usual daily caloric intake and dietary choices. Identifies current strengths and weaknesses in dietary program. Aids in determining individual need for adjustment and teaching. Establish a realistic weight reduction plan with the patient such as 1 lb weight loss per wk. Reducing caloric intake by 500 calories daily theoretically yields a weight loss of 1 lb per wk. Slow reduction in weight is therefore indicative of fat loss with muscle sparing and generally reflects a change in eating habits. Encourage patient to maintain a diary of food intake, including when and where eating takes place and the circumstances and feelings around which the food was eaten. Provides a database for both the adequacy of nutrients eaten and the emotional conditions of eating. Helps focus attention on factors that patient has control over or can change. Instruct and assist in appropriate food selections, such as a diet rich in fruits, vegetables, and low-fat dairy foods referred to as the DASH Dietary Approaches to Stop Hypertension) diet and avoiding foods high in saturated fat (butter, cheese, eggs, ice cream, meat) and cholesterol (fatty meat, egg yolks, whole dairy products, shrimp, organ meats). Avoiding foods high in saturated fat and cholesterol is important in preventing progressing atherogenesis. Moderation and use of low-fat products in place of total abstinence from certain food items may prevent sense of deprivation and enhance cooperation with dietary regimen. The DASH diet, in conjunction with exercise, weight loss, and limits on salt intake, may reduce or even eliminate the need for drug therapy. Refer to dietitian as indicated. Can provide additional counseling and assistance with meeting individual dietary needs. Deficient Knowledge: Absence or deficiency of cognitive information related to specific topic. Verbalize understanding of disease process and treatment regimen. Identify drug side effects and possible complications that necessitate medical attention. Maintain BP within individually acceptable parameters. Describe reasons for therapeutic actions/treatment regimen. Assess readiness and blocks to learning. Include significant other (SO). Misconceptions and denial of the diagnosis because of long-standing feelings of well-being may interfere with patient and SO willingness to learn about disease, progression, and prognosis. If patient does not accept the reality of a life-threatening condition requiring continuing treatment, lifestyle and behavioral changes will not be initiated or sustained. Define and state the limits of desired BP. Explain hypertension and its effects on the heart, blood vessels, kidneys, and brain. Provides basis for understanding elevations of BP, and clarifies frequently used medical terminology. Understanding that high BP can exist without symptoms is central to enabling patient to continue treatment, even when feeling well. Avoid saying “normal” BP, and use the term “well-controlled” to describe patient’s BP within desired limits. Because treatment for hypertension is lifelong, conveying the idea of “control” helps patient understand the need for continued treatment and medication. Assist patient in identifying modifiable risk factors (obesity; diet high in sodium, saturated fats, and cholesterol; sedentary lifestyle; smoking; alcohol intake of more than 2 oz per day on a regular basis; stressful lifestyle). These risk factors have been shown to contribute to hypertension and cardiovascular and renal disease. Problem-solve with patient to identify ways in which appropriate lifestyle changes can be made to reduce modifiable risk factors. Changing “comfortable or usual” behavior patterns can be very difficult and stressful. Support, guidance, and empathy can enhance patient’s success in accomplishing these tasks. Discuss importance of eliminating smoking, and assist patient in formulating a plan to quit smoking. Nicotine increases catecholamine discharge, resulting in increased heart rate, BP, vasoconstriction, and myocardial workload, and reduces tissue oxygenation. Reinforce the importance of adhering to treatment regimen and keeping follow-up appointments. Lack of cooperation is a common reason for failure of antihypertensive therapy. Therefore, ongoing evaluation for patient cooperation is critical to successful treatment. Compliance usually improves when patient understands causative factors and consequences of inadequate intervention and health maintenance. Instruct and demonstrate technique of BP self-monitoring. Evaluate patient’s hearing, visual acuity, manual dexterity, and coordination. Monitoring BP at home is reassuring to patient because it provides visual and positive reinforcement for efforts in following the medical regimen and promotes early detection of deleterious changes. Help patient develop a simple, convenient schedule for taking medications. Individualizing medication schedule to fit patient’s personal habits and needs may facilitate cooperation with long-term regimen. Explain prescribed medications along with their rationale, dosage, expected and adverse side effects, and idiosyncrasies Adequate information and understanding that side effects (mood changes, initial weight gain, dry mouth) are common and often subside with time can enhance cooperation with treatment plan. Diuretics: Take daily doses (or larger dose) in the early morning; Scheduling minimizes nighttime urination. Weigh self on a regular schedule and record; Primary indicator of effectiveness of diuretic therapy. Avoid or limit alcohol intake; The combined vasodilating effect of alcohol and the volume-depleting effect of a diuretic greatly increase the risk of orthostatic hypotension. Notify physician if unable to tolerate food or fluid; Dehydration can develop rapidly if intake is poor and patient continues to take a diuretic. Antihypertensives: Take prescribed dose on a regular schedule; avoid skipping, altering, or making up doses; and do not discontinue without notifying the healthcare provider. Review potential side effects and/or drug interactions; Because patients often cannot feel the difference the medication is making in blood pressure, it is critical that there is understanding about the medications’ working and side effects. For example, abruptly discontinuing a drug may cause rebound hypertension leading to severe complications, or medication may need to be altered to reduce adverse effects. Rise slowly from a lying to standing position, sitting for a few minutes before standing. Sleep with the head slightly elevated. Measures reduce severity of orthostatic hypotension associated with the use of vasodilators and diuretics. Suggest frequent position changes, leg exercises when lying down. Decreases peripheral venous pooling that may be potentiated by vasodilators and prolonged sitting/standing. Recommend avoiding hot baths, steam rooms, and saunas, especially with concomitant use of alcoholic beverages. Prevents vasodilation with potential for dangerous side effects of syncope and hypotension. Instruct patient to consult healthcare provider before taking other prescription or over-the-counter (OTC) medications. Precaution is important in preventing potentially dangerous drug interactions. Any drug that contains a sympathetic nervous stimulant may increase BP or counteract antihypertensive effects. Instruct patient about increasing intake of foods/ fluids high in potassium (oranges, bananas, figs, dates, tomatoes, potatoes, raisins, apricots, Gatorade, and fruit juices and foods/ fluids high in calcium such as low-fat milk, yogurt, or calcium supplements, as indicated). Diuretics can deplete potassium levels. Dietary replacement is more palatable than drug supplements and may be all that is needed to correct deficit. Some studies show that 400 mg of calcium per day can lower systolic and diastolic BP. Correcting mineral deficiencies can also affect BP. Review signs and symptoms requiring notification of healthcare provider (headache present on awakening that does not abate; sudden and continued increase of BP; chest pain, shortness of breath; irregular or increased pulse rate; significant weight gain (2 lb per day or 5 lb per wk) or peripheral and abdominal swelling; visual disturbances; frequent, uncontrollable nosebleeds; depression or emotional lability; severe dizziness or episodes of fainting; muscle weakness or cramping; nausea/ vomiting; excessive thirst. Early detection of developing complications, decreased effectiveness of drug regimen or adverse reactions to it allows for timely intervention. Explain rationale for prescribed dietary regimen (usually a diet low in sodium, saturated fat, and cholesterol). Excess saturated fats, cholesterol, sodium, alcohol, and calories have been defined as nutritional risks in hypertension. A diet low in fat and high in polyunsaturated fat reduces BP, possibly through prostaglandin balance in both normotensive and hypertensive people. Help patient identify sources of sodium intake (table salt, salty snacks, processed meats and cheeses, sauerkraut, sauces, canned soups and vegetables, baking soda, baking powder, monosodium glutamate). Stress the importance of reading ingredient labels of foods and OTC drugs. Two years on a moderate low-salt diet may be sufficient to control mild hypertension or reduce the amount of medication required. Encourage patient to establish an individual exercise program incorporating aerobic exercise (walking, swimming) within patient’s capabilities. Stress the importance of avoiding isometric activity. Besides helping to lower BP, aerobic activity aids in toning the cardiovascular system. Isometric exercise can increase serum catecholamine levels, further elevating BP. Demonstrate application of ice pack to the back of the neck and pressure over the distal third of nose, and recommend that patient lean the head forward, if nosebleed occurs. Nasal capillaries may rupture as a result of excessive vascular pressure. Cold and pressure constrict capillaries to slow or halt bleeding. Leaning forward reduces the amount of blood that is swallowed. Provide information regarding community resources, and support patient in making lifestyle changes. Initiate referrals as indicated. Community resources such as the American Heart Association, “coronary clubs,” stop smoking clinics, alcohol (drug) rehabilitation, weight loss programs, stress management classes, and counseling services may be helpful in patient’s efforts to initiate and maintain lifestyle changes. Activity intolerance: frequently occurs as a result of alterations in cardiac output and side effects of medication. Nutrition: imbalanced, more than body requirements: obesity is often present and a factor in blood pressure control. Therapeutic Regimen: ineffective management: result of the complexity of the therapeutic regimen, required lifestyle changes, side effects of medication, and frequent feelings of general well-being (“I’m not really sick”). Sexuality Patterns, ineffective: interference in sexual functioning may occur because of activity intolerance and side effects of medication. Family Coping: readiness for enhanced: opportunity exists for family members to support patient while reducing risk factors for themselves and improving quality of life for family as a whole. This was very very helpful.